The prophet Micah identified himself by his hometown, called Moresheth Gath, which sat near the border of Philistia and Judah about 25 miles southwest of Jerusalem. Dwelling in a largely agricultural part of the country, Micah lived outside the governmental centres of power in his nation, leading to his strong concern for the lowly and less fortunate of society—the lame, the outcasts, and the afflicted (Micah 4:6). Therefore, Micah directed much of his prophecy toward the powerful leaders of Samaria and Jerusalem, the capital cities of Israel and Judah, respectively (1:1). As a contemporary of Isaiah and Hosea, Micah prophesied during the momentous years surrounding the tragic fall of Israel to the Assyrian Empire (722 BC), an event he also predicted (Micah 1:6). Micah stated in his introduction to the book that he prophesied during the reigns of Jotham, Ahaz, and Hezekiah in Judah, failing to mention the simultaneous string of dishonourable kings that closed out the northern kingdom of Israel. Surrounding Micah’s prophecy of Jesus’ birth is one of the most lucid pictures of the world’s future under the reign of the Prince of Peace (5:5). This future kingdom, which scholars call the millennial kingdom, will be characterized by the presence of many nations living with one another in peace and security (4:3–4) and coming to Jerusalem to worship the reigning king, that is, Jesus Himself (4:2). Because these events have not yet occurred, we look forward to the millennial kingdom at some undetermined time in the future. 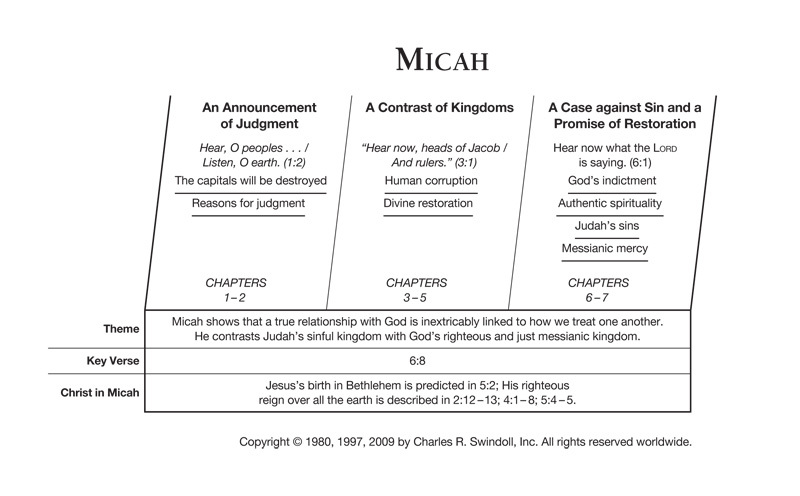 Find resources in the book of Micah in our resource library.